The best six men's baseball and women's softball European teams compete in Hoofddorp at the first-ever Super 6, an event. organized by WBSC Europe. When Luis Lugo from Italy went set, kicked and fired the first pitch to home plate at the beautiful ballpark in Hoofddorp, The Netherlands, it was a historic moment, as it was the start of a new era. The first WBSC Europe tournament was kicked off. Later in the game, Lugo pitched quite a gem, allowing only on run over six innings, keeping Germany’s offense rather quite. Meanwhile, the Italian lineup, packed with veteran Major League players like Alex Liddi (Seattle Mariners) or Chris Colabello (Toronto Blue Jays), could put some more pressure on the German pitching staff. Daniel Thieben was pulled after only 1.2 innings, but also Steinlein and Marquez didn’t last long, allowing a combined three runs over the first three frames. When Team Italy went to bat in the sixth, they started their first big firework. Leonardo Zileri, Andrew Maggi, Nicola Garbella and Alex Liddi all homered in the inning to give themselves an 8-1 lead. 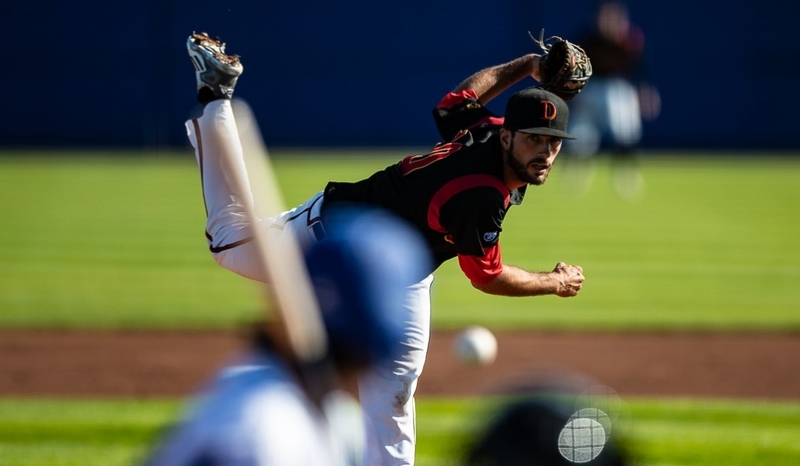 Just one inning later, the former MLB star Chris Colabello gave Germany the final stroke, hitting the ball over the fence for the 11-1, which ended the game after seven innings. The second game of the day featured a hot matchup between Belgium’s Red Devils and Spain’s La Furia Roja. Both teams are contenders at the Super 6 tournament. While Spain is trying to surprise once again and compete for the crown here in the Kingdom of the Netherlands, the Belgians are hunting the rest of the squad, trying to pass some higher seeded teams at the event. Belgium started off red-hot, landing single after single but only managed to score one run. The runs you don’t score will come right back at yo, they say. And so it was: A leadoff homerun by former New York Mets (MLB) Infielder Luis Guillorme tied the game, a triple and a misplayed ball to the shortstop got Spain the 2-1 lead. An inning later, Yancarlo Franco added another dinger, 6-1. The Spanish pitching ace recovered after his first inning and from then on kept the red devils rather cool. Meanwhile his offense gave him a decent run-support, piling up more runs. Engel Beltre, who once wore the jersey of the Texas Rangers (MLB), not only added two more runs with a homerun to make it 13-1, he also made a spectacular diving catch to end this second game of Super 6 baseball tournament. In the night game, the local fans could finally see their Team Kingdom NL, as the Netherlands entered the tournament with a matchup against the Czech Republic. Orlando Yntema, a pitching ace in Dutch’s highest league, the Hoofdklasse, kept the motivated Czech in check. His counterpart Radim Chroust also started off well into the game, but with two outs in the third inning, the Oranje started an offensive rally, landing a double, a triple and a homerun in that order – 4-0 the Netherlands. In the sixth inning, the Czech started off with a Matej Hejma to deep left field and was followed by another double, this time off the bat of Daniel Vavrusa, scoring their team’s first run. The Dutch jumped right back, adding two more runs through after a couple of singles, making it 7-1. As some might have written off the contending team from central Europe, but they proved them all wrong, putting up a great seventh inning, taking advantage of a few walks and hustling out a few singles. The Czech piled up five runs in the inning, making it a 1-run ballgame. After that, the Dutch pitching staff, in the person of Kevin Kelly, recovered and closed the door for a 7-6 win, walking away with their first win in the tournament.